“A” stands for ANTI-SEASICK TABLETS: This is most definitely a must. 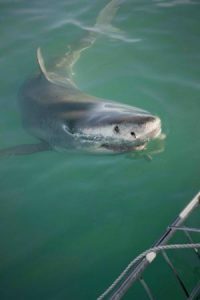 Even those who are accustomed to the motion of the ocean, feels the rise of green around their gills after being anchored in the same position for 3 hours on a shark cage diving vessel. “B” stands for BATHING SUIT: Yes, I know it seems self-explanatory, but you won’t believe how many people arrive without their swimsuits! It makes for some rather awkward moments on board, so please don’t forget yours! 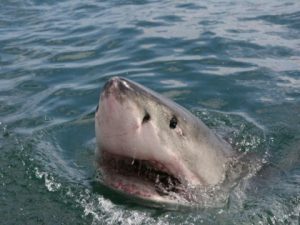 “C” stands for COOL, CALM and COLLECTED, plus some COMMON SENSE: This is the Golden Rule when it comes to dealing with sharks, whether you are observing them from the safety of a cage or whether you are swimming amongst them on a reef. So relax, keep your cool, enjoy this bucket-list moment and push those “Jaws” images far from your consciousness. But most importantly, use your common sense. The hardest part of Shark Cage Diving is putting on your wetsuit. So do not build this up to some scary monster under your bed that you have to face. You do not even need to be able to swim in order to shark cage dive. All you have to be able to do is hold your breath under water, just as if you are washing your hair in the bath! Sharks are very curious animals, so be ready to be surprised by their inquisitive intelligence, their immense power and their calm majesty.